Ever Wonder Why French Doors are Called French Doors? It’s something we were pondering recently – so much so that we decided to hop on the ol’ Internet and do some searching. We found all kinds of theories, including one which stated that home owners in France used to be taxed on the number of windows in their home, so to circumvent this they built the windows into their doors – but since they would still technically be windows, we fail to see how this idea would hold any water. The simple answer appears to be that the doors were merely popularized in French architecture, and in France they’re called porte-fenêtre” which translates literally into “window-door.” We assume that just sounded silly to whomever imported them to the US, and so they became French Doors. Fascinating, no? Popular for Both Interior and Exterior Architecture. History aside, French Doors have become popular in both interior and exterior architecture for the amount of natural light that they bring into a room. Most older french doors were made of wood, which meant that, as exterior doors, they were prone to rot and degradation over time due to exposure to the elements, pests and temperature changes. Lucky for us, newer generations of doors are made of sturdier stuff, and French Doors are no exception. 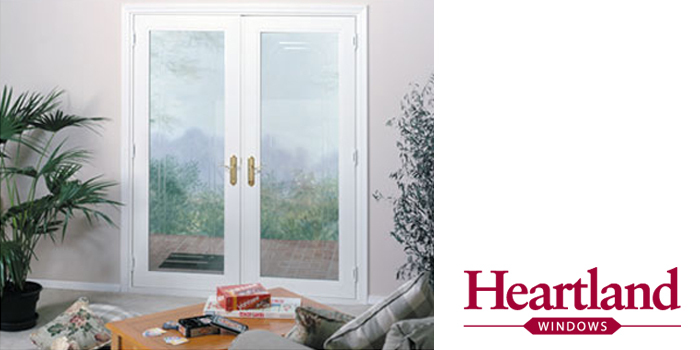 In fact, Wholesale Siding Depot now carries a line of vinyl French doors from Heartland Windows that are as durable as they are beautiful. These doors are custom-made to your exact window opening and feature elegant solid brass hardware, aluminum-reinforced sashes and steel fortified frames. Additionally, each door comes with adjustable hinges for precise installation, and can be adjusted in the future for alignment.